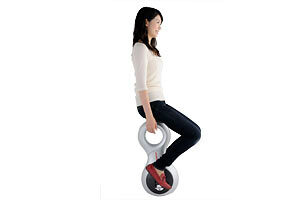 No, it's not a Segway or a unicycle. Honda's U3-X "personal mobility" contraption is a device that combines technology from Honda's ASIMO robot project with its omnidirectional driving system, which allows riders to scoot in any direction simply by shifting their weight. What appears to be a single-wheeled design actually includes several smaller motorized wheels, which make side-to-side movement possible. Still in the experimental-model stage, the U3-X has a top speed of 3.7 m.p.h. (6 km/h) and weighs less than 22 lb. (10 kg). A fully charged battery can power it for up to an hour.